Single Player, Xbox Live Multiplayer 1-2, Local Multiplayer, HD (High Definition). LUMINES LIVE! - a fresh installment to the blockbuster puzzle series has landed on Xbox Live® Arcade. Harnessing the power of the Xbox 360™, LUMINES LIVE! is a deeply rich and totally cool gaming experience. LUMINES™ LIVE! Standard Edition offers a stunning array of playable game modes including: 12 unlockable skins in Challenge Mode, Time Attack Mode, full multiplayer VS Mode on Xbox Live, 10 challenges each in Puzzle and Mission Modes, and 1 level of VS CPU Mode. All new Skin Edit Mode and plenty of downloadable content via Xbox Live Marketplace allows for customization of the LUMINES experience like never before. Don't miss out on the exciting world of LUMINES LIVE! There are no refunds for this item. For more information, see www.xbox.com/live/accounts. 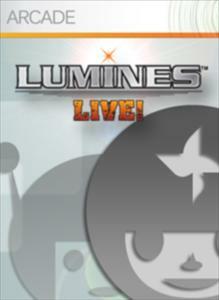 Theme Pack 1 - LUMINES™ LIVE! Give your screen some luminosity and sparks with this very stylish LUMINES Theme Pack, exclusively designed by art director Katsumi Yokota. There are no refunds for this item. For more information, see www.xbox.com/live/accounts.